20x Our huge selling ball launcher. 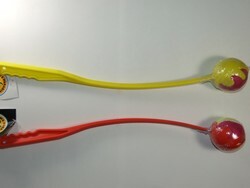 50 cm long handle helps to throw your ball further..
With this toy you will be able to throw the ball 3-4 times further than normal..
No more bending down to pick up a slobbery ball. Easy to use. The dogs will love it..
Comes supplied with a ball.